Finally, the document exposes the Palestinian terror group's plan for "real peace" in the Middle East. This "real peace," according to the jihadi group, can be achieved by eliminating Israel after "liberating Palestine, from the river to the sea, and after the original owners of the land return to their homes." This genocidal "peace" plan appears to be shared by other Palestinian terror groups, such as Hamas, the Popular Front for the Liberation of Palestine, the Democratic Front for the Liberation of Palestine and even certain parts of Mahmoud Abbas's ruling Fatah faction. The peace they seek is one that would result in the total destruction of Israel and the expulsion of all Jews from the Middle East. As the remarks of Abbas and PIJ show, Palestinians see Israel only as an alien body that was imposed upon Arabs and Muslims by imperialist Westerners, and not as people who have lived on that land for more than 3,000 years. The PIJ document, which serves as the group's "national charter," is a valuable text. Every word in the document reflects the true sentiments on the Arab and Islamic street, especially with regards to recognizing Jews' rights and history. This is a document that is currently being taught in Islamic Jihad training bases, and schools and mosques. It is a document that will help raise another generation of Palestinians on the glorification of terrorism and anti-Semitism. This is a document that deserves to be placed on the desks of all those Westerners who continue to tell us that peace is possible and that Israel just needs to make more concessions to achieve that goal. Haley, who has frequently sought Bolton's counsel on U.N. matters, agrees. 'For decades, the U.S. has been by far the world's single-largest provider of foreign assistance,' her staff writes in the memo. 'Numerous countries have taken advantage of this assistance while routinely opposing us in the U.N.'..."
On Thursday, 90 countries met in Rome hoping to make up a $65 million shortfall created by US funding cuts to the organization. This amounts to 30 percent of the agency’s total budget. UNRWA was established to provide temporary relief to refugees from Israel’s 1948 War of Independence. However, it has developed into a permanent welfare system that now serves five million Palestinians. It remains controversial for several reasons, among them the fact that it considers all descendents of the 1948 refugees to be refugees as well. This policy is unique in the world and applies to no other group of refugees. Concerns have also been raised about UNRWA employees’ ties to terrorism, the use of its facilities for terrorist purposes, and anti-Israel incitement in its media and educational activities. This year, the US chose to cut its donations to UNRWA in half. According to Foreign Policy, this was done in retaliation for the UN General Assembly’s condemnation of President Donald Trump’s decision to recognize Jerusalem as Israel’s capital, apparently at the urging of America’s UN Ambassador Nikki Haley. How Partisan Is the Issue of Israel? But, as was true last year, Gallup has come out with different results, even though it asks a similar question in its own telephone survey, “In the Middle East situation, are your sympathies more with the Israelis or the Palestinians?” Support for Israel was at 64 percent; a level reached just twice in the past three decades. But more interesting, since Pew’s findings don’t dispute that American opinion toward Israel is very favorable, is Gallup’s account of Democratic support. Although Gallup found Democratic support for Israel declining from 53 percent in 2016 to 47 percent in 2017, the 2018 survey shows support rising slightly to 49 percent. No implosion here. Gallup also showed that Israel’s favorability rating has surged to 74 percent, a 17-year high. Though there is a considerable gap between Democrats (64 percent) and Republicans (83 percent) on this question, those numbers do not suggest the beginning of the end of bipartisan support for Israel. With Pompeo, Trump will have a more effective and coherent overseas advocate for strengthening restrictions on Iran. In January, Trump waived sanctions against Iran as part of a periodic recertification of the deal in conjunction with Iran’s level of adherence. But he warned that he would not do so again in May unless co-signatories Britain, Germany and France agreed to additional restrictions on Iran that include holding inspections at all sites requested by international inspectors, preventing the expiration of “sunset” provisions limiting Iran’s nuclear program, and adding restrictions to the development of long-range missiles in addition to those on nuclear weapons. Both Trump and Pompeo would also like to use the threat of renewed sanctions and the decertification of the nuclear deal to put pressure on Iran to stop its meddling in Syria, including its entrenchment on Israel’s northern border, its funding of Hezbollah (and of Hamas), and its destabilizing influence elsewhere in the region. And this position on the Iran deal dovetails perfectly with the near-consensus position in Israel both in the government coalition and among most opposition parties. Finally, while Tillerson was uninvolved and reticent when it came to Israel – he did not visit here when he passed through the region last month – Pompeo has been outspoken in his support for the Jewish state. In November, Pompeo spoke at a gala dinner for a pro-Israel organization called Our Soldiers Speak, which brings officers from the Israeli army and other Israeli security agencies to the US. In his speech, he emphasized the Trump administration’s close cooperation with Israel and its support for Israel’s security. We welcome Pompeo as the secretary of state. His special relationship with the president will make his job easier as he promotes US interests abroad and takes action to fix a deeply flawed nuclear agreement with Iran. Palestinian groups in the West Bank and Gaza are urging mass protests Friday to mark 100 days since US President Donald Trump announced his decision to recognize Jerusalem as Israel’s capital. The so-called “day of rage” would be the latest in a series of weekly demonstrations, many of them violent, which have taken place since the December 6 announcement and subsequent moves for the US to move its embassy to the city. Many of the protests shrunk in size after the first few weeks. The Palestinian National and Islamic Forces, a coalition consisting of various groups, called on Palestinians to confront IDF soldiers and settlers immediately after the Friday prayers. Participation in the Friday protests will send a message to Israel that the Palestinians have not, and will not, forget the unjust decision against the Palestinians, the groups said in a statement. The Palestinian factions also called on Palestinians to prepare for protests marking Land Day on March 30. Land Day refers to the Israeli government’s 1976 decision to expropriate land in the Galilee — a move that sparked widespread riots that resulted in the death of six Arab citizens. The factions also urged the PA leadership to honor recent resolutions taken by Palestine Liberation Organization institutions to terminate all relations with Israel and revoke Palestinian recognition of Israel. What’s that deafening noise of squawking and screeching and flapping that we can now hear all around us? Why, it’s the West’s chickens finally coming home to roost. In Britain, a retired Russian spy and his daughter, Sergei and Yulia Skripal, remain critically ill in hospital after being poisoned earlier this month in the quiet cathedral city of Salisbury by a rare, military- grade and deadly nerve agent. In 2006, another former Russian spy, Alexander Litvinenko, died after being poisoned in a London hotel by a rare, highly radioactive isotope – a murder that a British public inquiry decided was likely ordered by President Vladimir Putin himself. There has been a subsequent string of suspicious deaths in Britain of Russians and others who may have fallen foul of the Kremlin – mysterious suicides, heart attacks while jogging, falls from buildings. Yet only now is Britain looking again at these bizarre coincidences. It has been all too keen to host an influx of Russian oligarchs – some of them allies and some enemies of Putin – who moved to London, buying up British assets such as football clubs or newspapers, hosting fawning politicians on their yachts and bringing with them unimaginable wealth, including dirty money, on which the City of London has been happily floating. So Britain allowed itself to become a kind of offshore island of the Russian mafia state. It was a case of never mind the gangsterism, just pocket the cash. Is it surprising, then, that Putin now curls his lip in contempt? The EU has said it will support Britain against Russia. Since the EU is hard-wired against confrontation, this is likely to cause Putin less discomfort than a pot of caviar past its sell-by date. UNRWA called on the United States to help avert a summer shutdown after pledges at a donors’ meeting in Rome on Thursday for humanitarian assistance to Palestinian refugees fell short. Some $100 million in pledges for 2018 were received from the dozens of countries that gathered for the morning conference to help fix a $446m. funding shortfall in the budget of the United Nations Relief and Works Agency. The crisis – billed as the worst in the agency’s 70-year history – was caused in large part by the Trump administration’s decision not to renew its annual pledge of $364m. To date it has given UNRWA only $60m. for 2018, with US President Donald Trump threatening to not provide further funding until the Palestinians agree to negotiate with Israel. The US has also said that other countries should pick up their “fair share” of the tab for the organization’s $1.2 billion budget. Initially UNRWA had feared that 2018 funds would dry up in May, thereby forcing a halt in services to 3.5 million Palestinians in Gaza, the West Bank, Syria, Lebanon and Jordan. UNRWA Commissioner General Pierre Krähenbühl said that it was now likely that services could be provided into the summer, but added that the agency still had to evaluate the impact of the pledges it had received that morning. Krähenbühl said, “This is a continuous effort, today was a start,” adding, “We hope the US will come up with more money. “All of us recognize the importance of the contributions the US has made in the past and emphasized the importance of the US continuing to make its contributions to the agency,” he said. The Trump administration in a statement said it “sympathizes deeply” with the families whose lawsuit against the Palestine Liberation Organization may soon be considered by the Supreme Court, but continues to maintain that the lawsuit does not meet the standards for review by the court. “The United States condemns acts of terror in the strongest terms and the Department of Justice is committed to prosecuting those who commit terrorist attacks against innocent human beings to the fullest extent that the law allows,” said a statement emailed this week to JTA by a Justice Department spokeswoman. The Supreme Court will say by March 29 whether it will consider the appeal by the litigants in the case known as Sokolow v. Palestine Liberation Organization. The plaintiffs won $656 million in a 2015 federal jury verdict, but it was overturned a year later by an appellate court. A filing by the solicitor general last month siding with the PLO drew angry rebukes from conservatives, including some of the Trump administration’s most steadfast Jewish community defenders. Netanyahu reportedly made the remarks during the cabinet meeting on Sunday when he relayed the details of his meeting with Trump in Washington a week earlier. According to the TV report, Netanyahu said his conversation with Trump about the 2015 nuclear deal was attended by Vice President Mike Pence, then-Secretary of State Rex Tillerson, Defense Secretary James Mattis, National Security Advisor H. R. McMaster, and White House Chief of Staff John Kelly. According to a report in the Axios news website, Trump told the prime minister that he was demanding “significant changes” to the 2015 accord and vowed to walk away from the Obama-era accord unless the European countries fixed it. However, Trump said that so far, Germany, France, and the United Kingdom have only offered “cosmetic changes,” the website said, quoting Israeli officials. An edited version of this article appeared in The Age, and on the websites of the Sydney Morning Herald and Canberra Times. Iran seems ever more confident it will achieve its hegemonic ambitions in the Middle East now it controls four capitals. Comments made by US President Donald Trump ...highlighted the fact that while the threat to world peace posed by North Korea has dominated the headlines in recent months, Mr Trump is determinedly focussed at least as much on another rogue state, which probably poses an even greater threat in the longer term – Iran. ... while North Korea threatens violence, Iran is already instigating or provoking it on considerable scale – in Syria, Lebanon and Yemen and, recently, by flying a drone into Israel from Syria, prompting Israeli reprisals. In fact, most of Israel’s top military analysts now say it is only matter of time before further violence, probably on a much larger scale, develops between Israel and Iran. THE Labor Party may be set to endorse unilateral recognition of a Palestinian state at its conference in July, but a new poll has revealed that only a fraction of its voters are in favour. In the YouGov Galaxy poll conducted in February, commissioned by the Executive Council of Australian Jewry (ECAJ), only 13 per cent of respondents favoured recognising a Palestinian state without a peace deal. Among Labor voters, the figure was 14 per cent. Twenty-five per cent of Labor voters favoured recognition after the conclusion of a peace deal, while 14 per cent said recognition should only come after all Palestinian groups renounced violence. Of all 1205 respondents polled, 35 per cent gave a response of “don’t know”, a figure that according to ECAJ co-CEO Peter Wertheim, “reflects the fact that the Israel–Palestinian conflict is not front-of-mind for most Australians, and demonstrates a reluctance by many to express definitive views on issues which they recognise are complex”. In the last few years, NSW, Queensland, Tasmania, Western Australia and South Australian Labor have passed motions recognising Palestine or calling on Federal Labor to do so. A homeland security conference took place in a southern Mississippi town with an Air Force base and a shipbuilding yard. Among those in attendance were the commandant of the U.S. Coast Guard; a general from India, the world’s second-largest country; and representatives from Taiwan and South Korea, a U.S. ally in a key trouble spot. But Israel was the star. The International Homeland Defense and Security Summit, organized by the state government, was held Tuesday in this Gulf Coast city far from any Jewish population center, in a state the local Israeli consul visits only twice a year. But representatives of 16 Israeli companies attended, along with a delegation from its Defense Ministry and arms industry. And speakers, especially Mississippi Gov. Phil Bryant, couldn’t stop talking about Israel. Bryant credited a national security conference he spoke at in Israel in 2016 as the inspiration for this one. One of the first pictures he showed during his speech was of him grinning with Prime Minister Benjamin Netanyahu. The admiration went beyond the governor. A Palestinian driver hit four Israeli men with his car Friday afternoon, killing two of them and seriously injuring the others, outside the Mevo Dotan settlement in the northern West Bank. The military said it was investigating if the incident was a terror attack or an accident. The driver was injured and arrested at the scene, according to the Israel Defense Forces. According to Hadashot news he is known to security forces and has in the past been incarcerated for terror-related activities, increasing the likelihood that the incident was a deliberate attack. Palestinian groups had called for Friday to be a “day of rage,” in response to US President Donald Trump’s recognition of Jerusalem as Israel’s capital in December. The suspected car-ramming occurred next to an army observation post along the 585 highway near the entrance to Mevo Dotan, approximately 10 kilometers southwest of Jenin. Video from the scene showed Israeli and Palestinian medics treating the wounded. The area was also filled with representatives from the IDF, who inspected the wrecked car, which was tangled in barbed wire. With the US announcing cuts in aid money to the Palestinians, one might think the Palestinian Authority would try to cut expenses, but an invoice from a hotel stay by top Palestinian officials this month indicates the exact opposite. The document, obtained by The Jerusalem Post, shows that PA Foreign Minister Riyad al-Maliki and General Intelligence Service chief Majed Faraj, as well as two lower-level officials, stayed at the five-star Four Seasons Hotel in Baltimore, racking up a $14,250.20 bill, including room service and minibar purchases such as $42 on champagne, and a $4 Snickers bar. The entire bill was covered by the PLO Delegation to the US. The luxury hotel stay came not long after President Donald Trump said the US will no longer send aid money to Ramallah until the Palestinian leadership negotiates with Israel, and after the State Department cut $110 million of aid money to UNRWA, the UN agency for Palestinian refugees and their descendants. The US is UNRWA’s largest donor. On Thursday, a dozen countries pledged a total of $100m. to UNRWA. Among Faraj’s expenses was a $900 “miscellaneous charges” fee, plus several room service meals, including a $140.09 breakfast, and a late-night room service snack costing $91.31. He also raided the minibar, spending $32 on snacks in one day, including $8 each for some cashews and cookies, and racked up $120 in laundry charges. 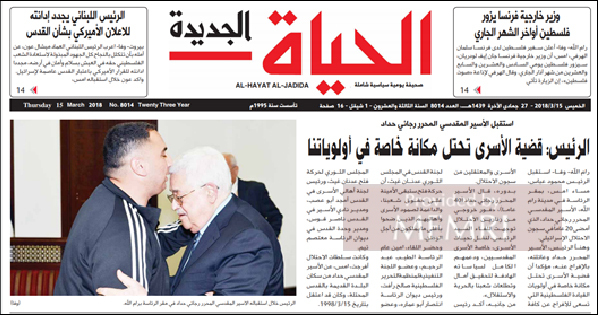 Faraj, a close adviser to PA President Mahmoud Abbas, underwent heart surgery during his stay in the US. At the same time, Abbas was reportedly receiving a routine checkup at Johns Hopkins Hospital in Baltimore. Once again an explosive device was detonated in the Gaza Strip. And once again it appears that Hamas was not responsible for the attempted terror attack. However, the spate of recent incidents in Gaza raises suspicions that something is particularly rotten in the kingdom of Hamas. At best, there are officials within the terror group who are not following the orders of the leadership; at worst, they may be receiving a quiet nod to work secretly against Israel. Thursday was not the first time that a roadside bomb within the coastal enclave has targeted Israeli troops or that the IDF has discovered explosives put in place to do just that. This, in areas that are supposed to be under the full control of Hamas forces. On Tuesday, the chaos had escalated in an unusually serious incident, when someone, at present unknown, attempted to murder Palestinian Authority Prime Minister Rami Hamdallah and PA General Intelligence Chief Majed Faraj as they visited Gaza. According to Hamas Deputy Interior Minister Tawfik Abu Naim, there were two 15-kilogram (33-pound) bombs placed 37 meters (120 feet) apart from each other. One bomb exploded but the second failed to detonate due to a technical problem. The devices were placed on the main north-south route through the Gaza Strip (Salah a-Din Street) only a few hundred meters away from the Erez border crossing to Israel — and under the nose of Hamas security forces. Lebanon plans to increase its military presence along its southern border with Israel, Prime Minister Saad Hariri said on Thursday at a meeting in Rome, where he is seeking financial support for the armed forces. Bolstering Lebanon's army and internal security forces is seen as a way for the international community to keep Hezbollah, which has helped sway the Syrian civil war in President Bashar Assad's favor, from broadening its clout in the Lebanese heartland. Some 40 countries participated in the meeting, along with and United Nations Secretary General Antonio Guterres. While some financial aid was announced on Thursday, Hariri said that the goal of the meeting was not to gather pledges. The Lebanese Armed Forces took no part in the 2006 war between Israel and the Lebanese Shiite terrorist group Hezbollah, which is backed by Iran. Since then, it has received more than $1.5 billion in U.S. military assistance and, in the last seven years, training and support from U.S. special forces. "We will be sending more LAF troops to the south, and we stress our intention to deploy another regiment," he said, adding that Israel "remains the primary threat to Lebanon." "While we are thinking of ways to move from a state of cessation of hostilities to a state of permanent cease-fire, Israel continues to make plans to build walls on reservation areas along the blue line," Hariri said. Mamsani said he was not forewarned about his dismissal, which occurred while he was on sick leave abroad. Mariwan Nasqshbandy, the director of religious coexistence at the Endowment and Religious Affairs Ministry, hinted that the firing could be an effort by the Kurds to reconcile with Baghdad following shaky relations after an independence referendum in September of last year. In the referendum, 93 percent of Iraqi Kurds voted for secession and an autonomous state. The IDF chose to make relatively rare use of a vehicle mounted Directed Energy Warfare (DEW) system called THOR—developed by the Israeli Rafael Advanced Defense Systems—in order to destroy a large explosive device that was discovered on the border of the Gaza Strip last December. In the incident, observers from the Gaza Division identified two terrorists who tried to exploit the IDF’s focus on dealing with disturbances near the security fence in the area of the Gaza neighborhood of Shuja’iyya, in order to plant an explosive device. The forces were directed by observers, isolated the scene and, using the mounted laser system, detonated the bomb. The radius and fragments from its explosion led the army to conclude that, would it have been triggered near IDF troops, the results would have been fatal. The laser system has been in use for a number of years by IDF forces, mainly in the security sectors on the northern and Gaza borders, and aims to remotely and safely neutralize threats such as improvised explosive devices (IEDs), unexploded ordnance, mines and other explosive threats.